The 1920 census revealed that, for the first time, more Americans were living in urban areas than rural ones. In Virginia, however, this historic transition did not occur for another thirty years; it was not until 1950 that the census recorded that the majority of Virginians lived in cities and towns. But the process of urbanization had been occurring for centuries. The English encouraged urbanization in colonial Virginia, but Virginia's plantation economy and well-developed system of rivers militated against the growth of towns. Virginia's cities grew slowly, but they did grow. By 1860, Richmond, Petersburg, Norfolk, Alexandria, and Wheeling all had populations greater than 30,000. Cities in the state were closely connected to the countryside around them. Both before and after the Civil War, cities served as markets for local agricultural produce and provided manufactured goods in return. After the Civil War, city populations started to grow. Freedmen migrated to urban areas looking for greater opportunity. The expansion of the railroads, fueled by northern capital, also encouraged urban growth. Tobacco manufacturing, flour and textile milling, and the processing of agricultural products remained the most important urban activities. Richmond became a national leader in the production of cigarettes. Danville and Martinsville, with easy access to southern cotton and wool, became booming textile centers. Martinsville also became a center for furniture manufacturing. The industrial revolution also affected the way Virginia cities grew. Railroads carried coal across the state to Norfolk and Newport News, which became booming ports. Hampton Roads became a naval base, and shipbuilding became an important industry. By the 1920s, Newport News Shipbuilding and Dry Dock Company was the largest employer in the state. Improvements in transportation allowed cities to grow physically. After the Civil War, trolleys were still being pulled by animals. Access to central cities was difficult. Generally, wealthier people lived downtown while the working classes lived on the outskirts. Electric trolleys changed that. Electric streetcars were introduced in Richmond in 1888 and quickly adopted by other cities: Danville later in 1888 and Norfolk in 1894. Streetcars made land surrounding the city available for suburban development, further separating places of employment from residences. This expansion and separation contributed to another nineteenth-century phenomena—racial segregation. While the downtown served as a hub of activity and provided employment for all, residential neighborhoods became race specific. As cities grew, so too did the demand for services—water, gas, electricity, police and fire protection, and sewage. In Norfolk, telephone service was introduced in 1879 and electric lights two years later. By 1900, most Richmond homes were wired for electricity. In contrast, 90 percent of Virginia's farms remained without electric power until World War II. Cities grew in other ways too. Adjacent areas often wanted to be annexed in order to receive better services. The expansion of the city of Norfolk through annexation—Brambleton in 1887 and Atlantic City in 1890—was typical of the period around the turn of the century. Cities were retail centers, and downtown stores provided goods to city residents as well as those from the surrounding region. Saturdays were busy days as trains and cars brought shoppers, many of whom traveled fifty miles or more to spend the day in the city. The population of Virginia's urban areas swelled with migrants from the countryside during both World Wars. Military installations, munitions works, chemical plants, and furniture factories all expanded. The village of Hopewell grew from a hamlet of 400 in 1916 to a city of more than 20,000 in a few short months. When it opened in Arlington in 1943, the Pentagon employed more people than lived in the county two years earlier. After World War II, the Cold War, with its expanding military-industrial complex, ensured a continuation of the federal spending and military-related industry in Virginia. Would you like to learn more about urbanization in Virginia? Visit the Virginia History Explorer. The postwar era also brought increased suburbanization and ushered in a two-decade period of rising prosperity. New home construction boomed, and young families moved out of crowded central cities. Suburbanization increased even more with the desegregation of public schools, especially after the widespread implementation of busing in the 1970s. White flight was followed by the exodus of many middle-class African American residents from central cities. Retail stores also moved to the suburbs, often locating in shopping centers—later called malls. By 1990, more than 80 percent of all Virginians resided in the state's forty-one cities and 188 incorporated towns. Half the state's population now lives in Northern Virginia and the Hampton Roads area. Of the roughly one million Virginians who live in rural areas, only around 60,000 are farmers or farm workers. This represents less than 1 percent of the population. 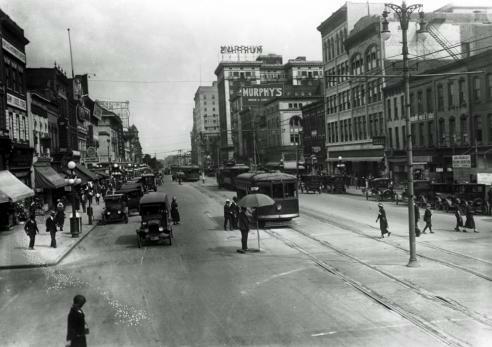 Broad Street looking east, Richmond, 1924 (VHS accession number: 2002.266.41). 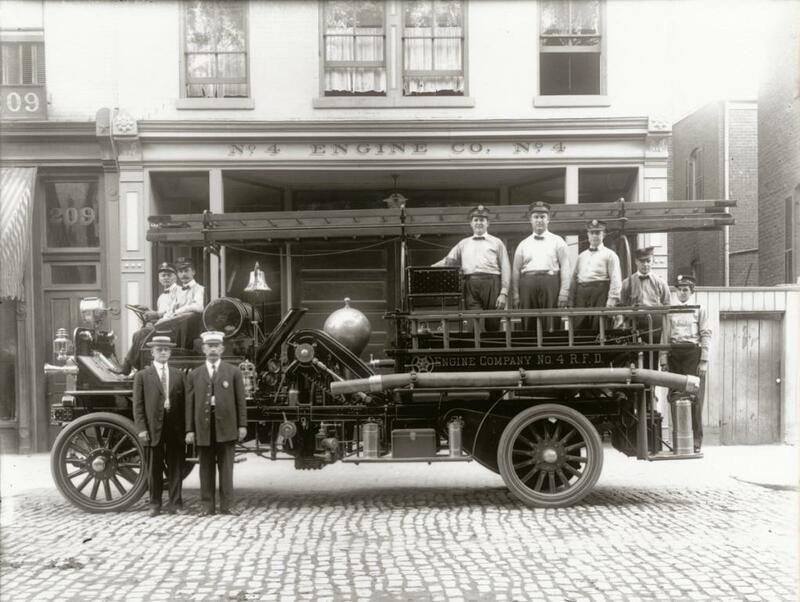 Engine Company #4, Richmond, 1911 (VHS accession number: 1991.1.21240). The New York Lunch Room, Norfolk, 1919 (VHS accession number: 2008.56.1). Black and white photographic print of the New York Lunch Room in Norfolk, 1919. Shows the interior of the restaurant. One man sits at the lunch counter that spans the length of the right wall. Three men are seated at the individual tables along the left wall. A waitress stands in the middle of the room and a waiter is seen behind the counter. The "Bill of Fare" is hanging on the right wall. The image is a contact print made from a glass negative, one of a set of forty-six. The negatives were rediscovered in 1968, and an edition of ten copies each was produced in 1986-87 by David E. Johnson, Peter Stewart, and Wallace E. Dreyer of Old Dominion University. The views are all of shops, mostly interiors, in downtown Norfolk, dated Nov. 1919 from calendars in some of the scenes. Project researchers were able to identify only a few of the businesses. 27.94 cm x 35.56 cm. Colonial Beach (VHS accession number: 1999.17.1852). Black and white photograph postcard, in the surf, Colonial Beach, Va. Photograph probably taken early 20th century. Correspondence on the back, stamped, postmarked Aug. 11, 1910. paper, 8.89 cm x 13.97 cm. Weldon's Market, Richmond, early 20th century (VHS accession number: 2001.230.799). 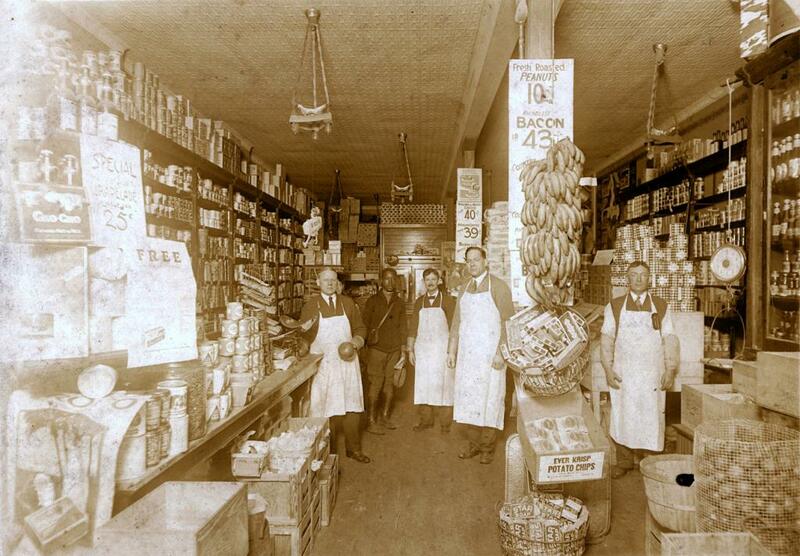 The photograph is an interior view of Weldon's Market located on Robinson Street between Kensington and Stuart Avenue, with five men standing.